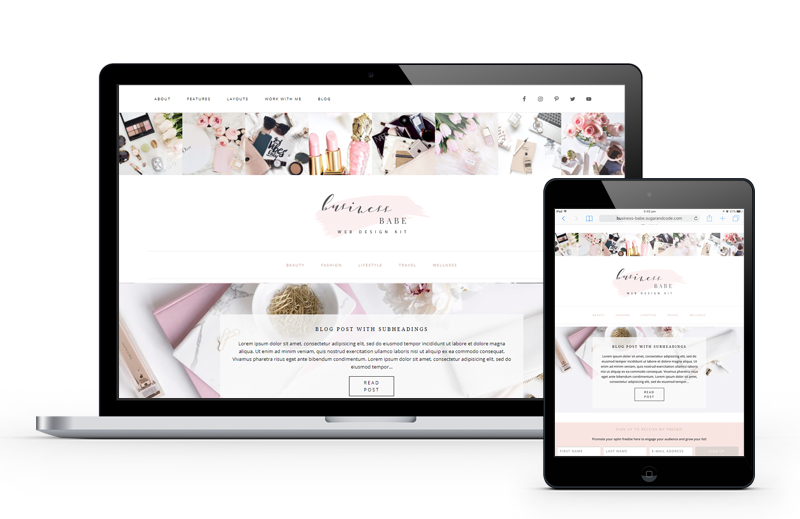 Business Babe is a feminine blogging & eCommerce Genesis WordPress theme – perfect for an author, speaker, coach, creative, or business owner. Following the design trends set by the top bloggers & designed for maximum conversions, the design features a full-width slider, strategic link boxes, stunning Instagram galleries and feminine detailing. Add your logo, photos, content and then change the colors to create a designer quality, gorgeous website or blog that your visitors and readers will absolutely love. Fully Responsive Design – your site will look gorgeous viewed on a desktop, tablet or mobile Mailing List Integration – with MailChimp, Convertkit, etc Email Capture – start building an audience immediately Social Media Integration – page links and share buttons Slider – gorgeous full-width featured posts slider Call To Action Boxes – stylish call to action image links and buttons Blog Category Page – display your blog categories beautifully Instagram Gallery – display your Instagram gallery in the header and/or footer instagram widgets Logo Uploader – ability to upload your own logo/header OR simply type in your blog title to match the default styling Live Color Customizer – choose your brands colors and see your changes before going live Full Width Layout – clean full-width design great for a landing or sales page Sidebar Content Layouts – alternate blog right or left sidebar layout for a traditional blog style Widgitized Blog Sidebar – social channels, subscribe function, post categories, Instagram gallery, search, etc. Contact Form Integration – for your audience to reach out to you Woocommerce Compatible – shopping cart software to sell unlimited physical, digital and even affiliate products to your audience! Our Web Design Kits include everything you need you start a site froms scratch or rebrand with a new design! This theme also comes with instant access to my Build a Blog Babe course which walks you through step by step video tutorials so that you can launch your blog quickly and confidently. Bonus Course - Step by step video course that walks you through launching your new blog! You’ll first need a domain name and web hosting but don't worry, I walk you through it all from the beginning in the set up tutorials if you're just starting out! Like us to Install the theme for you?! If you don't have time to install the theme yourself, or you’d just prefer us to take care of it all – we offer a theme & demo install service. All our themes and templates are designed for hosted installations of WordPress.org OR WordPress Business accounts. This theme will not work with free WordPress.com sites. This theme is incomatible with any other platform and will not work with Squarespace, Shopify, Wix, etc.